As Time Goes By is one of the most original British comedy series to grace the small screen and proves that love is ageless. The series stars the delightful Judi Dench (as Jean) and the witty Geoffrey Palmer (as Lionel) that were once lovers during the Korean War. As the war progressed, they soon drifted apart but almost 38 years later, the two soul mates finally meet up and rekindle their lost love. Since then, these two lovers have become very different people and now have families of their own. Jean is now a window with one daughter of a successful secretarial company, whereas Lionel is a writer who has just recently been divorced. The beauty of this series is the relationship between the two main characters and how they fit their old lives in with the new. The first DVD introduces both these quirky characters and sets the pace for the entire season as whether these two star crossed lovers should remain good friends or try to rekindle their long lost romance. Series two on the other hand, concentrates more on the relationships between these two mature lovers and the problems that they face. All in all, a very funny and thought provoking series. The video quality of the DVD is a little grainy and dull at the best of times and considering that the series is from 1992, it can almost be forgiven. If you are purchasing this series or renting it, you are really not looking for quality but rather the quality of the comedy series itself that I'm sure purest shall enjoy immensely. The audio quality of the DVD supports Dolby Digital 2.0 stereo and is reasonably clear and audible and there was no syncing problems whatsoever. 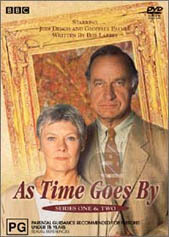 As Time Goes By is a quaint DVD series that proves that romance still lives no matter what your age. Easily one of the most well scripted and acted comedy series from Britain that is sure to find a good home for fans of the series or for those that like to think with their comedy. The unfortunate aspect of this DVD is that no extras were included in this DVD package.